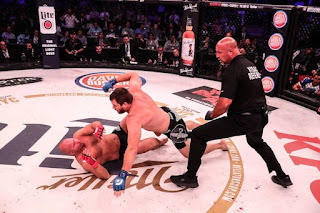 Bellator NYC/180 took place Saturday night at Madison Square Garden in New York City, and the event was for the most part a success, as it featured a number of exciting upsets and violent finishes. Following the card, these are my predictions for what's next for several fighters who competed on Bellator's second-ever pay-per-view. 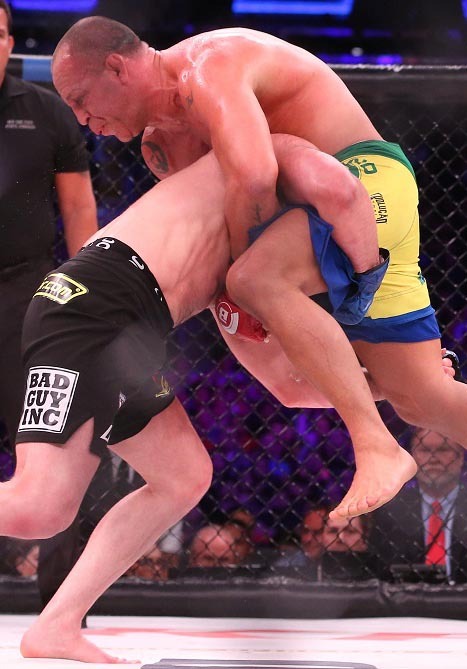 The main event of Bellator NYC saw Chael Sonnen survive an early knockdown courtesy of Wanderlei Silva to outwrestle "The Axe Murderer" and win a unanimous decision. The first round of the fight was very exciting, but by the second round it became clear we were watching a fight between two over-the-hill 40 year olds. Both guys still clearly have drawing power, as a $1.6 million total gate (on 12,133 fans in attendance) at Madison Square Garden shows, but it was far from a good fight. For Sonnen, he's been chirping with Tito Ortiz and he also called out for a fight against Fedor Emelianneko, both of which are obviously big fights. Sonnen is a smart guy and he's going to get a big fight his next time out, for sure. As for Silva, he didn't look good in the fight, but he seems hungry to get back in the cage. Bellator will likely look to bring in another aged light heavyweight legend to fight him, and Chuck Liddell is absolutely a possibility. The co-main event saw MMA legend Fedor Emelianenko get brutally KO'd by Matt Mitrione following a double knockdown early in the first round. At 40, Fedor should now strongly consider retirement after suffering such a vicious knockout. 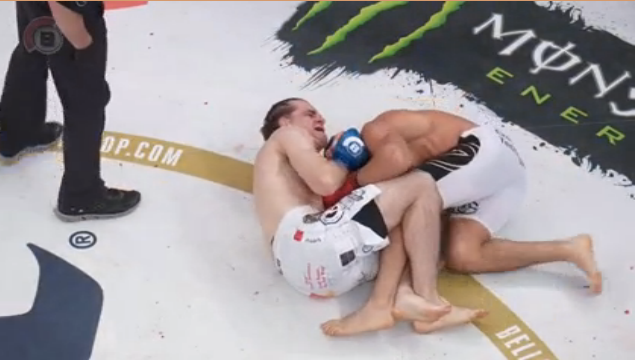 It was hard to see Fedor lose in that fashion, but for Mitrione it's the biggest win of his career. He really should be fighting for the vacant belt in his next fight. A rematch against Roy Nelson would make sense, or perhaps a fight against Cheick Kongo. One of the strangest moments of the night came in the lightweight title fight between champ Michael Chandler and challenger Brent Primus. Early on in the fight Primus landed a low kick on Chandler's ankle which injured the champion, who continued to fight on like the warrior that he is. The referee eventually called in the ringside doctor to take a look at Chandler, and the fight was waved off via TKO. An injury caused by a strike is a legitimate way to win, but at the same time there does seem to be unfinished business between these two, which is why a rematch seems likely. That depends, of course, on how serious Chandler's injury is. But if it's something he can come back from in a few months, then Bellator needs to set the rematch up. In one of the biggest upsets of the year, Zach Freeman shocked the world with a first-round submission win over highly-touted prospect Aaron Pico. Freeman came into the fight off of a loss, and at 32, many observers wrote him off as an overmatched opponent for the 20-year-old Pico, who had tons of hype coming into his MMA debut. But Freeman stopped the hype train by absolutely destroying Pico in one of the biggest shockers in a while. For Freeman, this is a big win for him, but the problem is he's not marketable for Bellator. The fighter himself even admitted Bellator didn't seem happy he destroyed their golden boy. This win over Pico should earn him a credible veteran his next time out, but it remains to be seen what Bellator has planned for him. As for Pico, this was a bad loss, but he's still young and will get better. He will learn from this. You just hope Bellator doesn't match him up with someone with so much more experience. So I think Bellator should sign another young fighter without a record or with maybe one or two fights and let him fight Pico. Not someone with 10 fights like Freeman. The opening main card bout saw the underrated Douglas Lima defend his Bellator welterweight title with a unanimous decision victory over Lorenz Larkin. Outside of a brief knockdown by Lima on Larkin in the second round, the fight wasn't as exciting as fans had hoped, but it did prove once again how underrated Lima is. For his next fight, it seems likely Lima will fight Rory MacDonald, who is fresh off of a submission win over Paul Daley. Lima vs. MacDonald is a terrific fight and could very well be on the next Bellator pay-per-view. As for Larkin, he didn't look great in the fight and a step back for him makes sense. A fight against a gatekeeper like Fernando Gonzalez could make sense for him next. The headlining act of Bellator 180, the preliminary card before the Bellator NYC pay-per-view, saw Ryan Bader win the Bellator light heavyweight title with a split decision victory over Phil Davis. This was Bader's first fight in Bellator since signing a huge free-agent contract, and he delivered the goods by winning the title. It was far from the most exciting fight on the card, but considering the tough stylistic matchup posed by Davis, this was a quality win on Bader's resume. For Bader, his first title defense will likely come against one of two fighters: Linton Vassell and Muhammad Lawal. Either man would be a good choice for Bader's next opponent, but if I had to guess, Bellator will go with Lawal, seeing as how they originally had booked him against Bader anyway. This would be the perfect main event for a Friday night Spike card. That would leave Vassell without an opponent, which is why I think he should fight Davis for the next title shot. It's not like Davis was dominated by Bader -- he just got outworked a bit and lost a split decision. So it makes sense for him to stay in the title picture, and a fight against Vassell works as a co-main event on the Bader vs. Lawal card. Bellator (180) NYC: Sonnen vs. Silva takes place June 24, 2017 at Madison Square Garden in New York, New York. Click the stars to rate how good you think Bellator 180 will be.